You are here: Home / Notes 101 / How To Profit With Real Estate Tax Liens! How To Profit With Real Estate Tax Liens! Interested in profiting from real estate but looking for an alternative to mortgages, foreclosures, tenants, or flipping real estate? Purchasing the right to collect on delinquent real estate taxes can be a lucrative investment even with limited capital. Counties generally assess taxes on real estate to owners each year and allow for payment by a certain date. The bills are assessed based on property value and can range from a few hundred dollars to several thousand dollars. If the taxes are not paid when due they become delinquent and the county can charge interest. In many states the counties are allowed to assign their right to collect the delinquency to an investor. When the property owner pays the levy to the county, the investor receives their initial investment plus the interest. The allowable interest varies by county but runs between 5-18 percent per annum on average. If a property owner fails to pay the delinquency within the required time frame the investor can initiate proceedings to obtain a deed to the property. Tax liens generally take priority over all other property debts, including mortgages. Prior to making the investment thoroughly research the property to confirm it is marketable and to avoid any problem properties. Be certain the value of the property far exceeds the county tax bill. A general rule of thumb is a property value at least ten times the amount owed. It is important to realize the process and procedures will vary greatly by county and that not all states participate in tax lien sales. 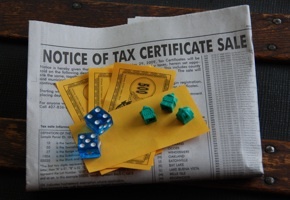 Also keep in mind there is a difference between tax lien certificates and tax deeds. Control and ownership of the property is only possible through a tax deed after any specified redemption period has expired. For example, in Orange County Florida taxes become delinquent for non-payment April 1 of the following year. The county then publishes the sale of certificates in the newspaper during the month of May. An interested investor can register to bid on the certificates at auction. Rather than an “in-person” auction, the bidding now takes place on the internet. Bidders must deposit 10% of the amount they expect to spend with the county. Orange County can charge 18% on delinquent taxes so the bidding starts at this maximum and is bid down. So a bidder willing to earn 10% would win out over a bidder desiring 12%. A winning bidder pays the county for the amount of delinquent taxes and earns their return when the bill is paid by the property owner (the county keeps the difference in interest between the amount collected and the investors winning bid). Investors owning certificates that have not been paid or redeemed by the owner for a period of two years are eligible to apply for a tax deed sale. The majority of property owners pay their delinquent bill before it goes to the deed stage. This allows investors to earn strong returns backed by real estate. When an owner fails to pay, it is possible for an investor to own a property worth thousands of dollars for an investment of just a few hundred dollars with much larger returns available on resale. Investing in real estate tax liens can also be profitable when used in conjunction with seller financing and/or self-directed retirement accounts as shown in Real Deal #154 – The Buy Wholesale Sell Retail Tax Deed. Since the investment is just a fraction of the property value, it can continue to provide profits in a softening real estate market. Author: Tracy Z. Rewey has been making money full time with owner financing for over 20 years. Gain knowledge from a well-known cash flow expert and author through real life examples. Read in-depth articles and sign up to receive the free weekly eletter.